After two weeks of sweaty walking and cycling we needed to do some washing. A bit of google maps investigation revealed that our closest launderette was at the Intermarche in Tarascon-sur-Ariege. It was only a small supermarket, but we managed to wedge ourselves into a corner parking space without being too much in the way and availed ourselves of the washing and drying facilities. Usually with these laundry facilities we don’t have any clashes, but today we had someone else waiting to use the dryer and could sense their exasperation as we went to check whether our clothes were ready and then put the dryer on for yet another session. With clean clothes and fluffy towels we moved onto our next destination. Aulus-les-Bains is a small town that is off the main roads of the Ariege. 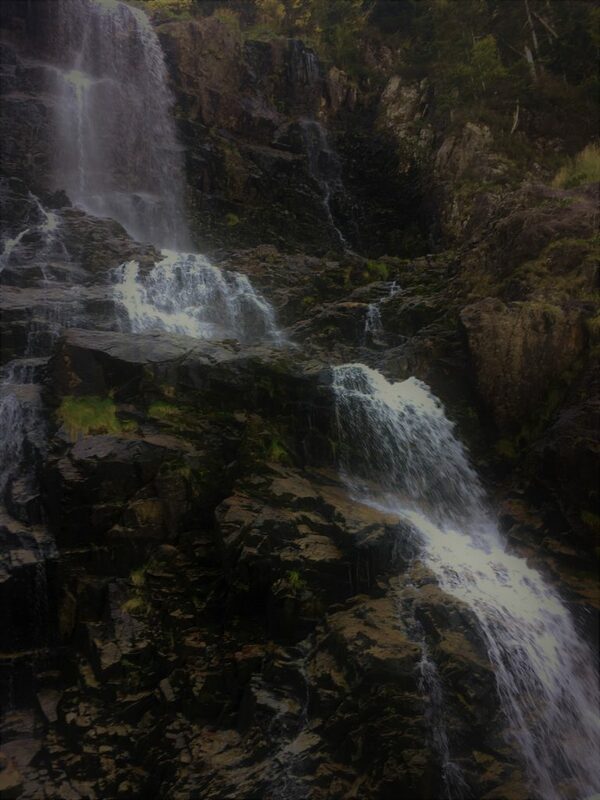 Like many places in the Pyrenees it is named for it’s hot springs. One of these days we’ll have to try them out, but like a cheapskate I’m waiting to find a freebie like the fabulous Saturnia hot springs in Italy. 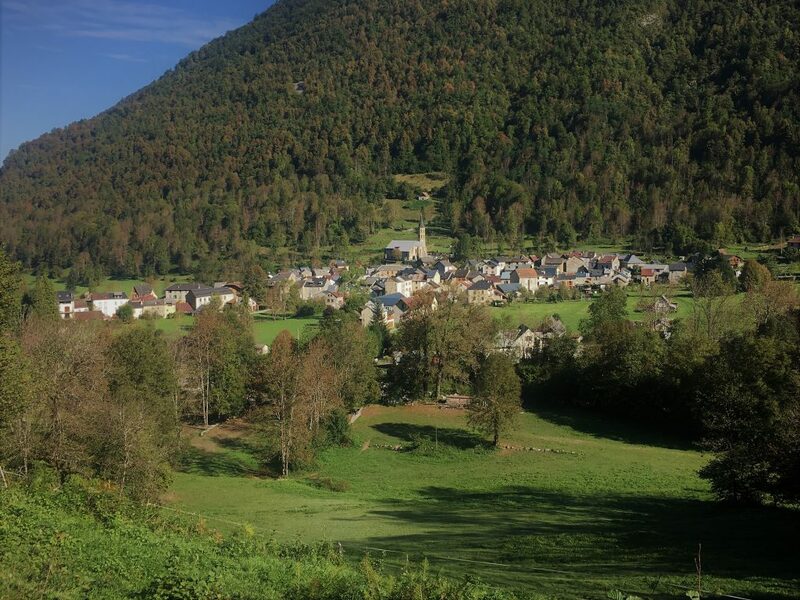 The drive to Aulus-les-Bains was pleasant to Vicdessos, where it became a little narrow. 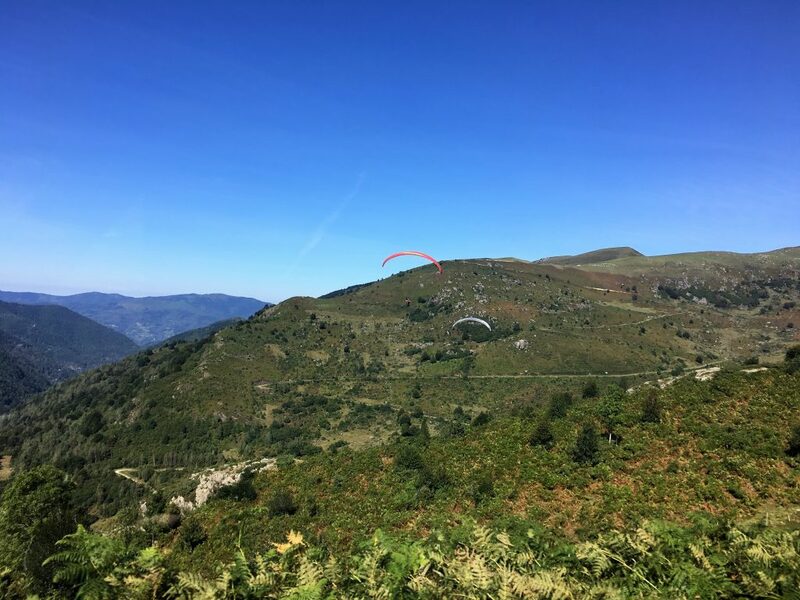 At Port de l’Ers the road improved again and above the lake there were paragliders soaring and a significant entourage supporting or just watching. 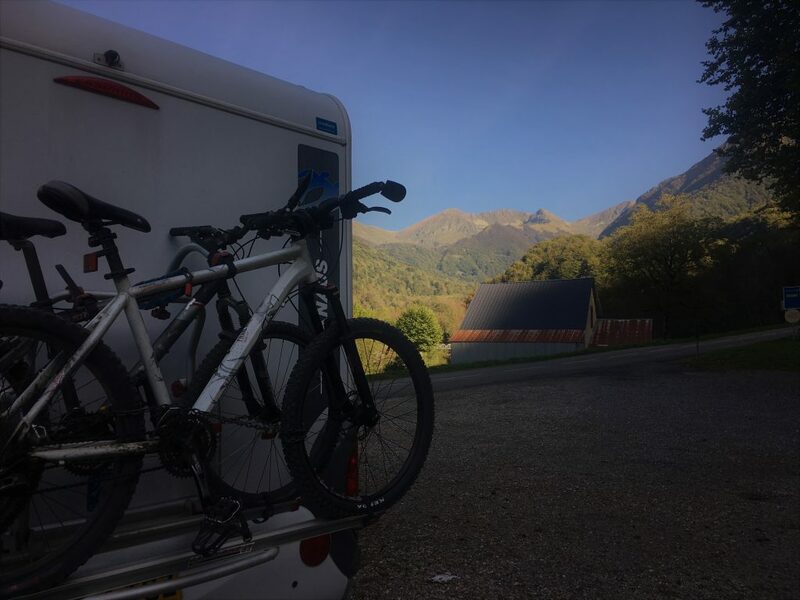 Aulus-les-Bains has a designated motorhome parking area for €2 per night plus free services outside the campsite. We parked ourselves up and popped into the Tourist Office to pay our parking fee and to get some local information. Lots of tourist shops and attractions were already closed up for the season but the town was still busy enough with (I assume) locals. The lady at the tourist office sent us onto the Thermal spa complex as she had run out of the booklet of walks of the area. A small office there handed over the booklet of ‘parcours’ and a walking tour of the town which we followed to stretch our legs. There are some smart looking 19th century hotels here (it’s not clear how many are still in operation) although the Thermes complex is a bit of an ugly modern block. 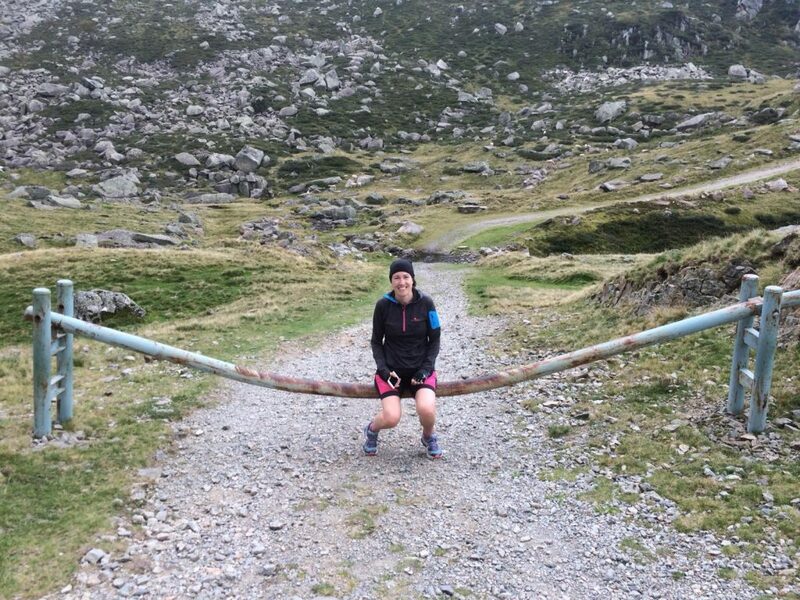 The following morning we decided to follow one of the routes in the parcours booklet. 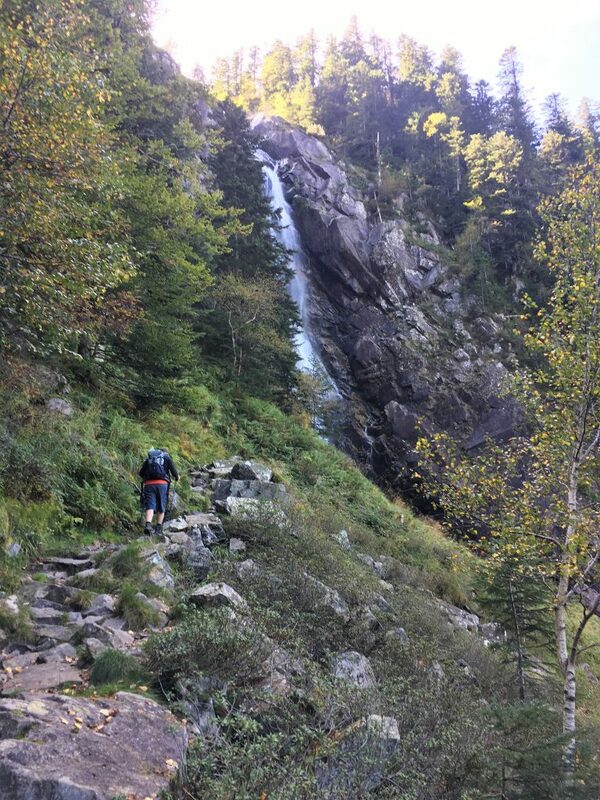 Route E is a circular walk that takes you to the Cascade d’Ars. We started from a trailhead on the hairpin just up the road from the motorhome parking where we followed a track into the forest. Eventually the track met up with the GR10 and we followed the usual red and white slashes up along the bank of the river Ars. 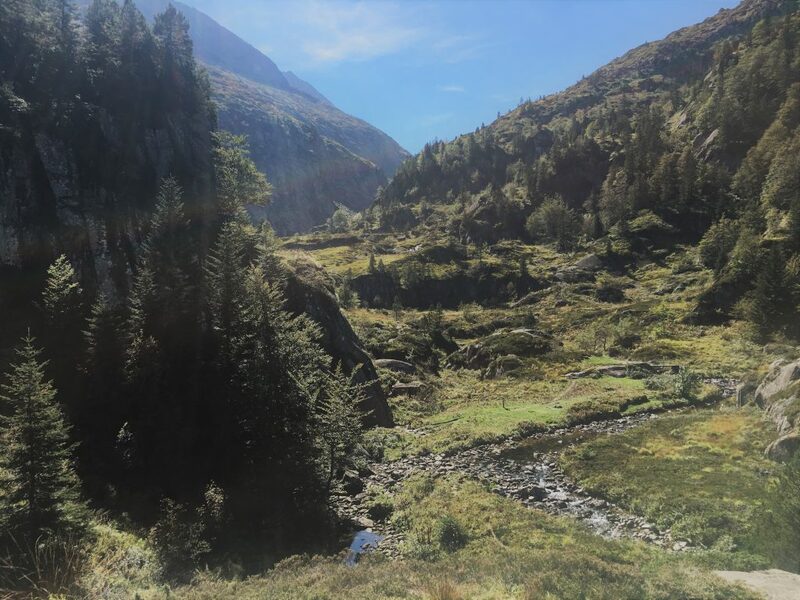 Sometimes we were right by the river as it flowed over boulders and at other times we were above the river gorge with just the sound of the river accompanying us. It wasn’t long before we reached the cascade, we didn’t know whether to expect much as it has been so dry, but it was still attractive and impressively high. A single stream at the top separated into multiple strands in the middle and then converged into one single drop again for the lower drop. The official path walked safely to the side of the waterfall, but there were numerous small paths that allowed us to get a closer view and feel it’s cooling spray. Getting to this point would be a nice walk in it’s own right, but we went onwards, following the GR10 up to the valley above the waterfall where the stream seemed far too innocuous to be feeding such a dramatic plunge and the fishes swimming lazily in the water seemed to have no fear of being swept over the edge. In the valley a signpost pointed out way onwards, still taking the GR10 on a gradual uphill traverse of the steep slopes where signs warned of avalanche dangers, skirting the head of a valley and crossing the squelchy plateau Guzettou. After several frustrating moments where we thought we had reached the top only to realise we had more uphill to go we thankfully found ourselves going consistently downhill. The path descended steeply through forest next to the Etang de Guzet whose black waters were glimpsed through trees (we didn’t descend to the lake because we couldn’t face going back uphill yet again). We were keeping an eye out for the point where we had to branch off the GR10 to make our return. When we found the point there was a signpost, but no letter E to point our way. We had to take a bit of a guess, luckily it was the right one, following the sign to the Piste de Fouillet (if we had translated the route description from the booklet we would have realised this was the right way – we’ll remember that next time). This took us through bracken and across pasture before heading back into the forest and steep zig zags back down to the road, just above our starting point. 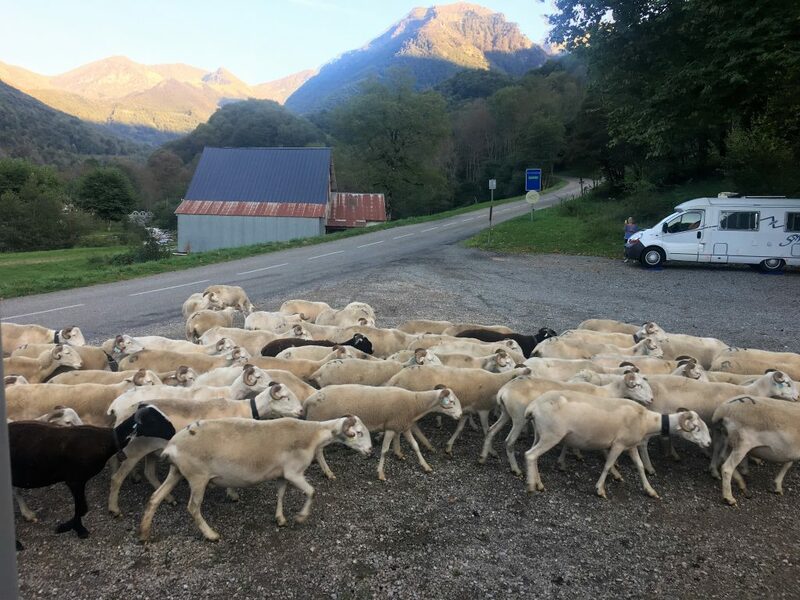 That night we decided not to stay in the town parking, but to drive up to the Guzet ski area which might be a little cooler and less smelly; the car park in Aulus was covered in sheep poo where a local herd had been walked down to the low pastures the evening before. The following morning we decided to use our mountain bikes to explore the area around the Guzet ski resort. 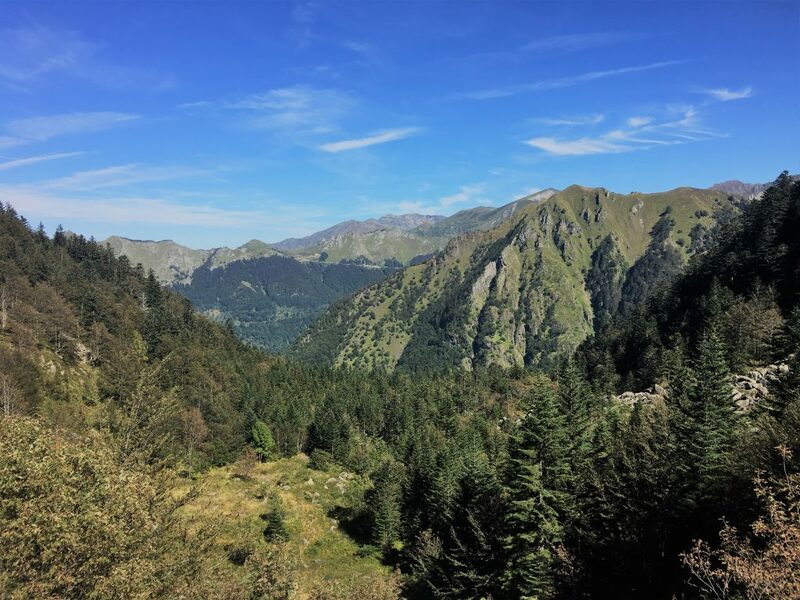 There is mountain biking here in the summer (known as VTT – Velo Touts Terrain – in France), but sadly the lifts stopped running the previous weekend so we had to get uphill under our own steam. We followed the road up through chalets and then took the track that bought us out above the ski area. Instead of heading straight back down we branched left on this track, heading roughly south around the contours of the hills for about 7km until we reached a point where the uphill looked too much of a struggle. Then we turned around, back to the ski area and down mountain bike routes (red 5 onto green 2) back to our parking spot. All along this route we had close up views of Griffon Vultures with their white heads and ragged looking long-fingered wings. 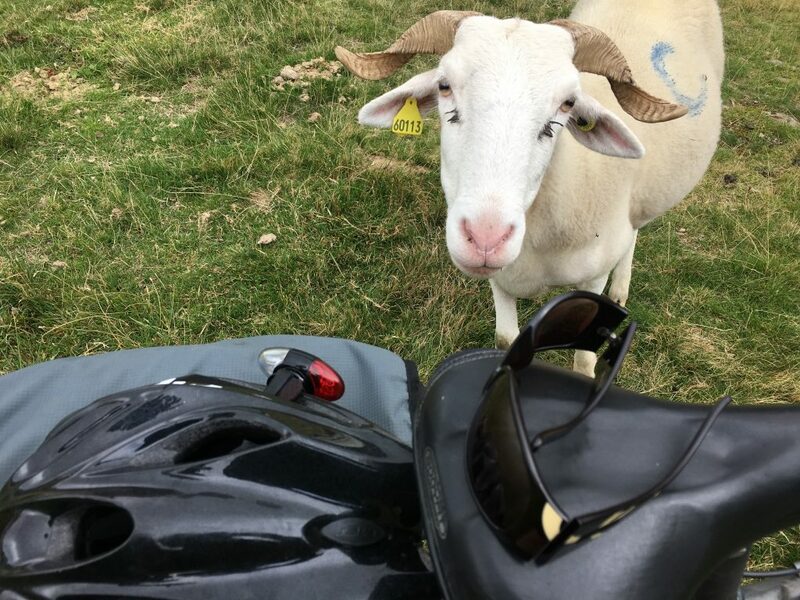 I don’t have any good photos of them, so instead here is a curious sheep. 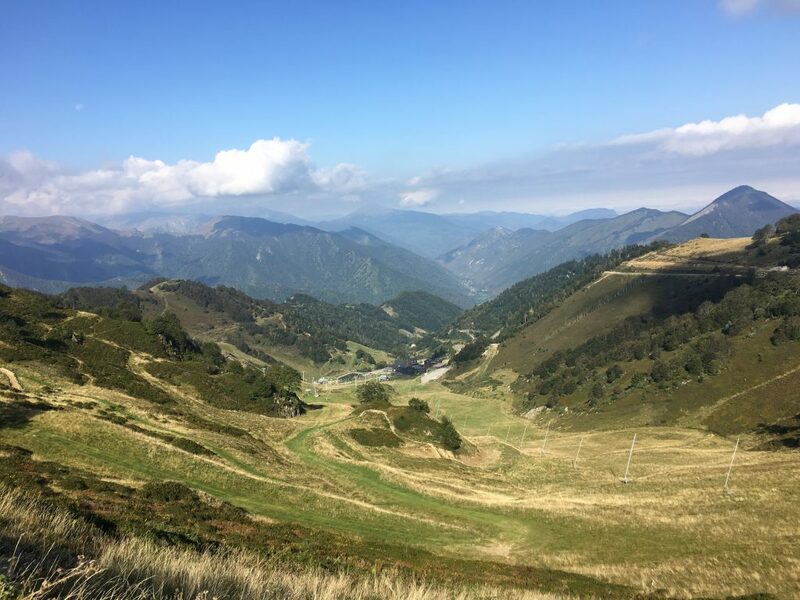 Further Information: IGN Carte de Randonnees Pyrenees 7. Guzet VTT map.